Have you ever wondered what reality TV would look like in Regency England? Like, what would the Kardashians be getting up to and how would they be portrayed? Ever wanted to read a book about a Regency scandal that went a little beyond someone getting caught in an orangerie? 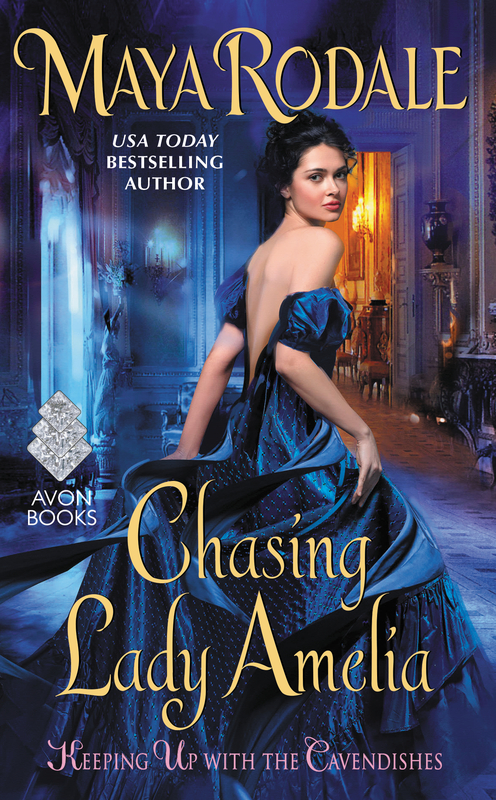 Then Chasing Lady Amelia is the book for you. I straight up adored this book. I loved the creativity, how Rodale took tropes of the genre we know well and turned them ever so slightly on their head. In this one, we have an American who has been brought to England largely against her will. Amelia is now the sister of a duke, although she has no real interest in being so, and is being trained to act accordingly. She knows she’s a catch and must enter the marriage mart, but is super reluctant to do so. Enter a mysterious stranger, Alistair, who is an heir to a begrudging uncle. 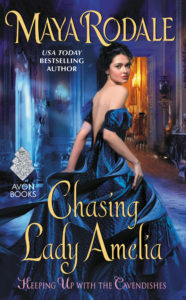 He’s been ordered to marry one of the scandalous Americans for their money and so when circumstances bring Alistair and Amelia together, Alistair sees it all as a win win situation. They spend a glorious day together, checking everything off Amelia’s London to-do list that’s been deemed inappropriate by her family, like touring Vauxhall Gardens and seeing a show at Astley’s Amphitheatre. Of course they fall in love and of course it’s quick and of course that’s slightly insane. What’s magic about this book is that Rodale convinces you it’s not insane for these two people to connect so quickly and so intensely. It works in the world she’s set up and I fell for the two of them hook, line, and sinker. Additionally, I loved that Alistair is half-Anglo, half-Indian. His race is a big part of how he navigates society, how he deals with himself, and the particular hero’s journey he’s on in this story. His introspective revelation towards the end of the book was so well plotted and well executed. For all of the portrayals of England as purely full of Anglo-Saxon Caucasians, colonialism and slave trades meant that was very rarely true. I appreciated this small, yet realistic touch on Rodale’s part. I absolutely recommend this book for anyone looking for a fun Regency-set romance with realistic characters, sparkling dialogue, and a creative plot. It occurs concurrently with Lady Bridget’s Diary, the first in this Cavendishes series, but can be read as a stand alone. I sipped a whiskey and ginger ale as I read, but a Pimm’s would probably be more appropriate! Appetite for scandal not quite whetted? Check out this blog, full of tales from Regency England. I got a complementary copy of this book from Tasty Book Tours, in exchange for a honest review and tour participation. Thanks! Fantastic review!! Thank you so much for sharing the love!